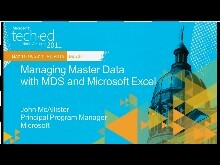 This session introduces Master Data Services (MDS) and describes typical solutions. Product demonstrations illustrate how Master Data Services can help synchronize operational systems and build better dimensions in analytic systems. The session includes an overview of MDS features including product demonstrations and shows how to get started implementing MDS.